Psilocybe Cubensis Ecuador originates from the Ecuadorian Andean region and is among the more popular strains today. This variety often produces very big mushrooms, even when the conditions are not perfect - hey, it can get cold up there in alpine altitudes. 1200ml of 100% mycelium and ready to grow substrate, enough for 2 flushes (minimum). 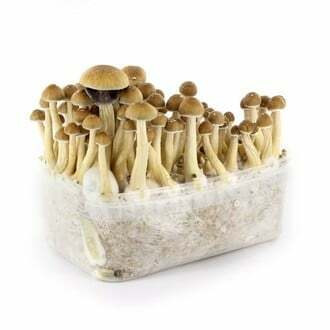 Psilocybe Cubensis Ecuador is a variety from the Ecuadorian Andean region often produces very big mushrooms, even when the conditions are sub-optimal - hey, it can get cold up there in alpine altitudes. Some users reported this strain has a speedy facet, like a rushing feeling as if they were on a mental and somehow exhausting marathon. Well, each to his own. These 100% mycelium kits contain a 1200ml cake of 100% mycelium substrate and come ready to grow to your doorstep. All you have to do is sit and wait, spray a little water every now and then and - harvest. Simply follow the steps on our online manual and you will be rewarded with a whopping amount of fresh mushrooms.